- Publisher "Managing your money is similar to building a house," David Bragonier says. To build your "financial dream house," you need to start with the basics--you need a floor plan and you need to lay the foundation. This book uses this metaphor to teach readers the basic principles and methods of money management in a way that is easily understood and applied. - Publisher Using the metaphor of a house, the authors offer principles and methods for money management. 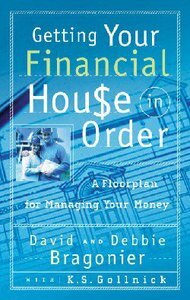 About "Getting Your Financial House in Order"
"Managing your money is similar to building a house," David Bragonier says. To build your "financial dream house," you need to start with the basics--you need a floor plan and you need to lay the foundation. This book uses this metaphor to teach readers the basic principles and methods of money management in a way that is easily understood and applied. Using the metaphor of a house, the authors offer principles and methods for money management. David Bragonier is both a seminar instructor for Crown Financial Ministries and executive director of Barnabas. Since 1984, David has been teaching God's principles for finances at seminars, conventions, and conferences. He writes a newsletter, regularly speaks on radio talk shows, has been a guest on television programs, trains lay counselors, helps churches implement their own financial ministry, and counsels individuals and pastors. Debbie Bragonier teaches women's groups about husband/wife relationships, children's finances, and other topics. On occasion, Debbie also joins Dave as a seminar and workshop speaker. David and Debbie have been married since 1970 and have five children whom they have home schooled since 1985. They reside in Stanwood, Washington.